We started to build Bimbul (aka Hoop Pine) in July of 2015. We knew it wouldn't be a quick build as we were going to do a lot of the work ourselves - that not done by our builders, Kev and Chris Moran. Nevertheless, we were hopeful that we would be in by September. We were happy to work in with Kev and Chris, who obliged our every whim, just so we could keep up all the other works that needed doing eg plumbing, earthworks, driveway, electricals and such. But like most builds ours changed in the course of doing the actual work. We were fortunate in that our arrangement with our builders was mutually flexible, accommodating and innovative. We all worked, I thought, to achieve the best outcome: an appropriate cabin for the beautiful country we were proud to be showcasing and which we have been working hard to restore. Which is why September's deadline then became one for December. When we passed that date as well the end of January seemed imminently obtainable. It could have been but wasn't. The weather defeated us on this account. Then March came and went and so did easter. Not yet ready and neither was my blog so now it is May and I've decided to finish my blog seeing as the inevitable happened. We opened Bimbul for our guests. We took our first weekenders, Milton and Roslyn, on the 22nd of April. Included is their preferred photo. Thanks to Roslyn as, it turns out, she is a professional photographer. This is now our 2nd week of operation and it is going well with the fire place, the hydro, the view from the daybed and the sound of the creek, visible from the deck, being amongst the most deserving of comments. But now the reflections. So many other things were put on hold while we focused our full and (nearly) undivided attention on getting the best job possible and not putting anyone out in the process that we are, at the moment, enjoying days without a schedule or a deadline. We have no quibbles about how things progressed though: a good build happened in the best time possible. Although it took a little longer then our overly optimistic predictions and promises would have had it, nevertheless, it happened - is happening - and there are a lot of people who made this work as well as it did. We've had a memorable time – on reflection. 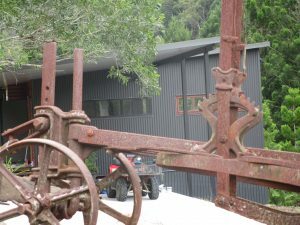 But the most exciting addition to our build, which is relatively unique, has to be the installation of our hydro-electric power system. 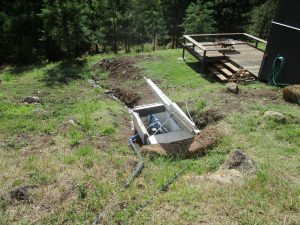 It took the entire time of this build to source the head (where we put the pipe into the creek), lay the pipe, build the enclosure for the turbine and wire it up to feed the cabin. Now that it is done, and working brilliantly, we can honestly say it has been worth it for both the learning curve we started – and finished – and for having the best form of renewable power generation that is available to us. For those who are keen to know more about how a hydro system works, the parts needed and the discoveries along the way that the novice (us:) would never have guessed is covered in another article I intend to post. To make this issue even more brilliant, Eccoinnovation, the company that manufactures the powerspout turbine in New Zealand, claims the unit is made from 68% recycled materials and is 100% recyclable as the finished product. But, wait! there's more. The water that is being returned to the beautiful Christmas Creek has to get there somehow. Having turned the turgo wheel of our turbine the used water now has to make its own little creek, what we have called, imaginatively, Bimbul creek – the latest tributary to a greater catchment. It is also a feature of our build as it flows gently past the lower deck where our unique outdoor fireplace is situated. One further item needing mention and done in more detail in another blog is the restoration of country. In order to make the weed infested, ex-dairy paddock suitable for Bimbul and reveal the creek, we had to spend many hours taking out lantana, glycene, croften weed, cotton weed, devils fig, nogurra burr and others I don't even know the names by which they go. I estimated over nearly five years we spent at least 25 hours peeling the vegetation back, layer by layer. The result was worth it. The transformation was a pleasure to behold. The final result, though satisfying, does not hint at its previous state. So the important point here is: that in the process of making a living off the land – from the hire of our cabins – we have helped in the re-establishment of country as it might have been and, if we have our own ambitions are ever realised, as it will once again be. This is sustainable living - you put more back than you take out.